Take the hassle out of hasselback with my easy way of making this cute Thanksgiving or Christmas side dish. 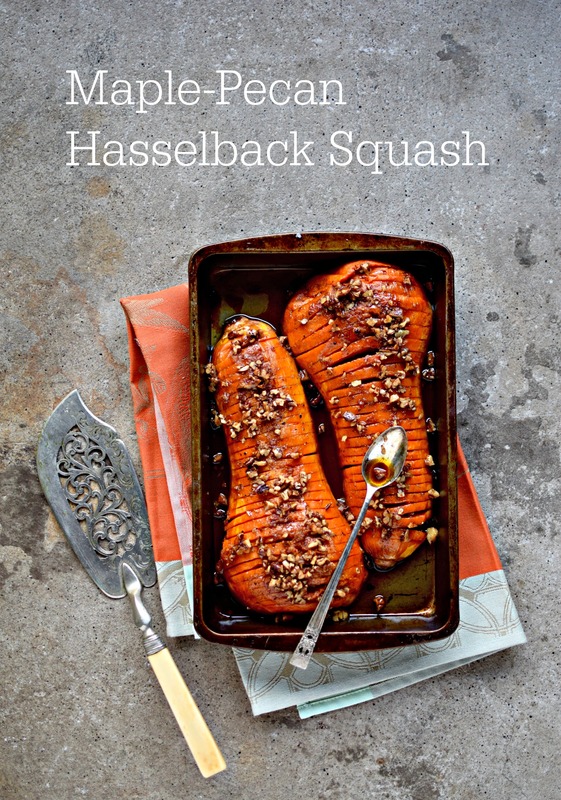 Normally seen on white potatoes, hasselback is also the perfect way to spruce up sweet potatoes or butternut squash. By part-baking before slicing and slicking with the flavourings, you save your fingers and your sanity. Top tip! You know, one of the best things about blogging and being part of the social media slipstream is you. Yes, you. But more and more these days I am getting messages from actual people (!) telling me that they’ve made one of my recipes. And, thrillingly for me, that they loved it. To a food writer it really doesn’t get any better than that: it feels better than Christmas, better than cookies from the oven, better even than the first proper snow of winter. It is on these days that rather than languish under the magnetically warm and inviting duvet, I fairly spring from my bed, brush my teeth and head for the kitchen, determined to do more, and do it better. Of course I have work-work, too. Don’t we all. But I am doubly blessed that what I do “in real life” intersects with my fantasy-come-to-life world of creating recipes and sharing them. If you have ever messaged me with even the vaguest hint of praise or support, then believe me it is a tonic to the soul. And I thank you. Thanksgiving is the biggie. Christmas is massive too. Obviously. But Thanksgiving Day, that non-denominational, gosh-we-are-still-a-nation day of celebration and family, is the sine qua non of American holidays. Where Christmas might be spent with just the nuclear family, tearing open presents and getting a bit sloshed on egg nog, Thanksgiving Day – well you can’t get away with that. It won’t do. Yes, a lot of it is now centered around college football (yawn), but it is the time to gather round a table – often a string of mismatched tables and chairs wedged around the room like a crazy human Screwball Scramble set – and just be together. Dropping the turkey, burning the stuffing, and playing tag you’re it with the sprouts is all part of the day. And tradition. That’s an integral part of it too. Thanksgiving is built on family traditions. At the end of the post I will give you links to my Thanksgiving-esque recipes, in case you are short a dish or two. These – as well as this current recipe – are also perfect for Christmas. Preheat oven to 200C/180C fan/400F. 1. Cut the butternut squash in half lengthways, then peel and deseed. Save the seeds for roasting if you wish (rub with a little oil and roast on a separate tray for about 12-15 minutes). Place cut side down in a snugly-fitting roasting tin or ceramic dish and brush with a little of the coconut oil; sprinkle with salt and pepper. Place in the oven and roast for 35 minutes. 2. While the butternut squash is roasting, mix together the remaining ingredients, except the sage. 3. Remove the squash from the oven, let cool slightly, then use a sharp paring knife to carefully cut about three-quarters down into the squash, making cuts across the way, as shown. Try not to cut all the way through as you’ll lose the effect – but it will still taste awesome! 4. Now spoon the spice and nut mixture over the squash, using the spoon or a fork to slightly part the slices to better wedge in the flavourings. It’s kind of tricky, so don’t stress this. 5. Pop the squash back into the oven and roast for a further 20-30 minutes depending on how fast your oven is and how thick your squash is, basting with the sticky juices once or twice. The thinnest ends will be much softer than the thicker ends. Serve warm with sage leaves tucked in. Getting ahead: You can roast as per step one a day ahead, then bring to room temperature before drizzling over the maple pecan glaze and carrying on as instructed. Or, you can cook the whole dish four hours ahead, keep at room temperature and give it a quick blast on 200C for 10 minutes. Soft food diet: blitz the pecans into dust before using. Cook the squash for up to an hour for maximum softness, covering to prevent burning if required. Need Some More Holiday Recipes? Incredible Cauliflower Mash – luxurious and oh so good! This looks great and perfect for the holidays. It’s hard not to fall in love with this maple-pecan hasselback…Your photo’s are so extremely gorgeous! Congratulations, Kellie! I read your posts, see your recipes and pics, and can see why people love it here. Reading this at some unearthly time in the morning, but makes me want to leap out of bed and make instantly. Looks so yummy. Thanks so very much, Liz. I do some of my recipe reading at unearthly hours too and I have to put up with my stomach growling! “Take the hassle out of hassleback” may just be the best line you’ve ever written! I love the looks of this recipe, and I’ve got an expats Thanksgiving dinner next weekend so I may just make this my contribution (along with pumpkin pies, which are always my thing). I benefit from the expat food holidays an extra time, since as a Canadian our Thanksgiving is back in October, but most of our friends here are American so we get a bonus round, which is a total score. Looking pretty amazing! We like to keep Thanksgiving going over the long weekend. I am tasked to stay the course with a traditional menu for the big day, but as the weekend progresses I am free to try new recipes. These Hasselbacks would be a fabulous addition! My goodness! I’m making this on Monday! Thank you for the endless inspo! Love the behind the scenes pic with the hairdryer! I have the opposite problem of course. Edible slinky.. you do make me larf! Aw thanks Kat. You too. 🙂 I’m working until 9.30 tonight but I am sneaking out to a nice lunch with my husband who had kindly taken the day off for me. I kind of screwed up this arrangement! Ah! So glad to find this idea, I have a butternut squash threatening to go kaput on the kitchen counter, and now I have something to do with it other than the usual cube and roast. Lovely blog and lovely photos.